Bars remain in place as a visitor scrolls on your page and can be closed by clicking the X at the right of the bar by default. Learn more on positioning your bar below. Bars stick to the bottom of mobile browsers by default as the bottom of a mobile device's display is most easily accessible. If dismissed, a bar will reappear upon page reload or any other page it is present. Navigate to the Conversion Tools tab on your account dashboard, then click Alert Bars. Select Create New Bar and name your bar. To access bar layouts, select the Settings tab from the left pane of the builder. To change the layout of your bar, simply click on a different layout display. NOTE: Selecting a different layout will override call-to-action text (button or link) and its click event. With the opt-in bar layout, you have the ability to collect opt-ins from visitors. 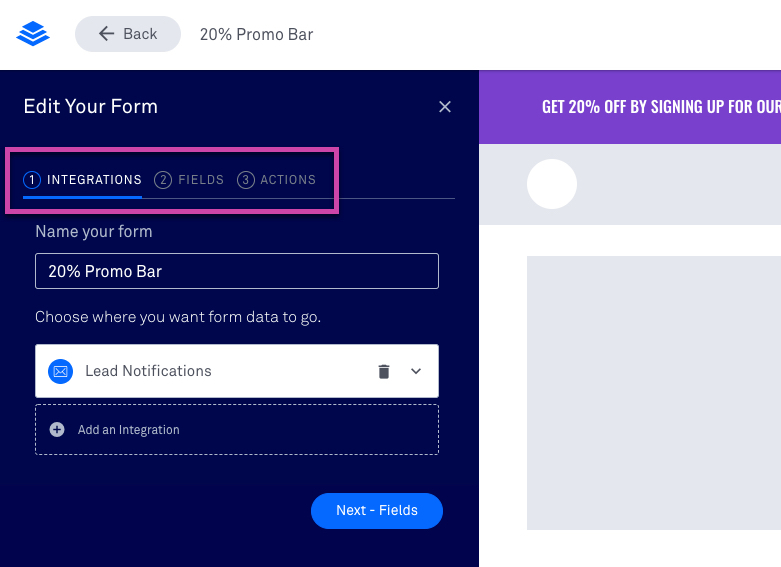 To edit your integrations and fields in the opt-in bar layout, simply hover over the form and click Edit Integrations or simply click the form field or call-to-action button. Your form settings will open on the left-hand side and you can customize your integrations, form fields, and follow-up sequence (i.e. thank you page, lead magnet). If this is your first time connecting an integration, or you'd like to connect another account or new service, click here for more information. Bars will default to only include an email form field. While it is possible to add more fields to your bar, we recommend not exceeding two fields on a bar. NOTE: A GDPR checkbox is in development for bars with an opt-in form. Editing form fields on a bar is similar to that of a form widget. Click here for more information. 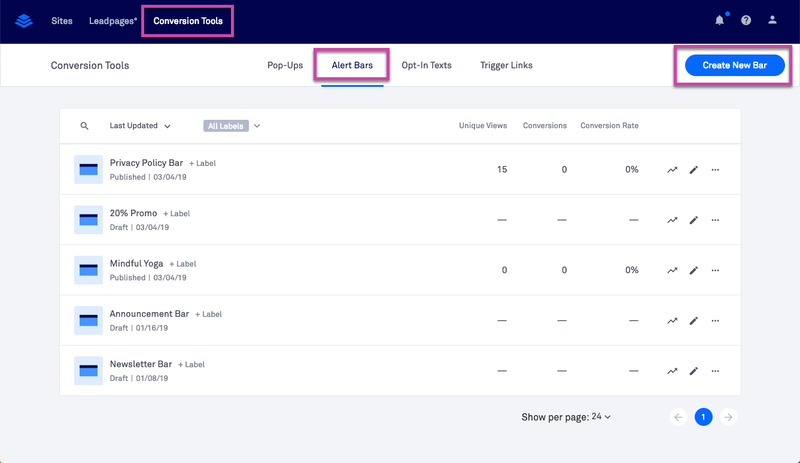 Under ③ ACTIONS you can choose where you'd like to send your visitors after they opt in to your bar as well as attach a lead magnet. You can send visitors to an external URL or a Lead Page via the button bar layout. To edit the click event for your button, simply hover over the button and click Add Click Event. You have the option to send visitors to "Open a Calendly pop-up," "Go to an external URL" or "Go to a Lead Page." Once you've selected your event and either pasted your URL or selected a page from the list of Lead Pages, click Save. Just like the button layout, the text link layout gives you the ability to link a visitor to a Calendly pop-up, an external URL or a Lead Page. Hover over the text link to edit your click event and follow the steps as laid out for the button layout to select and save a click event. The text bar layout is great for getting messaging and announcements out to your visitors. Just like the button layout and the text link layout, the text layout also gives you the option to link a visitor to a Calendly pop-up, an external URL or a Lead Page. To link your text, select the text you'd like to link, then click the link icon. Bars are positioned at the top of a page and remain in place when scrolling by default. However, by clicking the Settings tab and navigating to "Position," you can choose to reposition your bar. Select "Top" or "Bottom" to decide where you'd like your bar to appear on the page. Leave the "Remain in place on scroll" toggle on if you'd like the bar to remain in place, always at the top of the page, when scrolling. Toggle it off if you'd like the bar to scroll away as a visitor scrolls down the page. NOTE: When a bar is set to be positioned at the bottom of a page, it will remain in place when scrolling for optimal conversion. To edit any text or change its color and styling, simply select the text with your cursor or simply hover over the element and click the pencil icon. Click the B and I icons in the text settings panel to bold or italicize text, respectively. 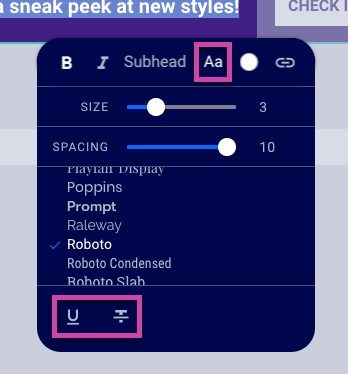 To add an underline or strike-through effect, first click the font icon (Aa), then toggle either option at the bottom of the panel, as shown below. You can choose between four settings that partially control your text size (along with the size settings in the font panel). You can change the setting by clicking it and choosing a new option from the list. You can link any text in your bar to a Calendly pop-up, an external URL or to a Lead Page. Highlight the text you’d like to turn into a link, then click the link icon in the widget settings panel. Once you've selected your event and either pasted your URL or selected a page from the list of Lead Pages, click Save. If you have a button on your bar, click the button or hover over it and click the pencil icon to access its settings. 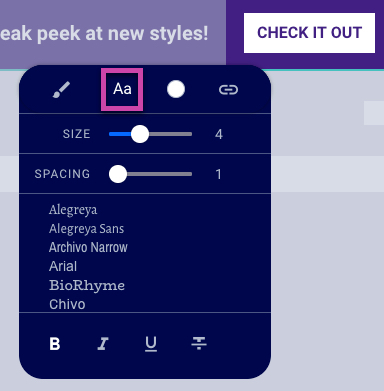 Click the font icon (Aa) to adjust the font, size, line spacing, and style of your button text. Within the font settings you can also format your text in bold, italics, underline or strikethrough. In the style menu, you can choose between square, rounded, or circular corners for your button. 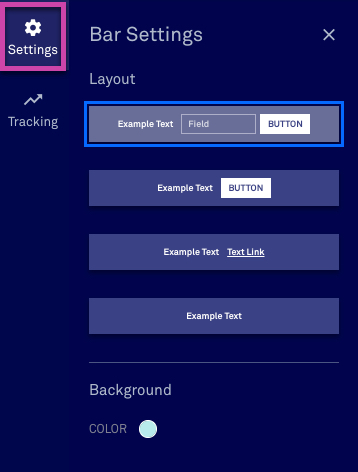 You can also choose between a flat, outline, or gradient style of button. The color picker allows you to choose from your brand colors, a few recent colors, or click ADD next to "Recent Colors" to enter hex codes or select a different color/opacity for your button as shown above. 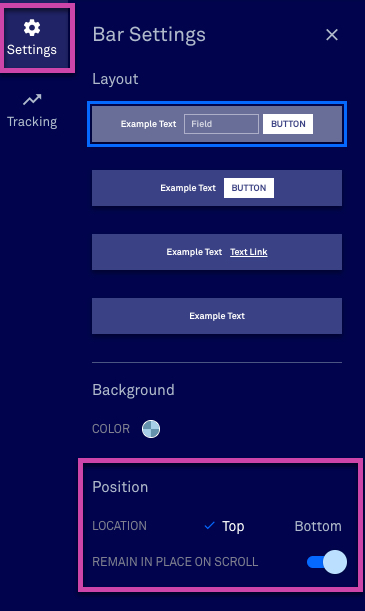 Change tabs between "BKG" and "Text" to edit the background or text colors on your button. 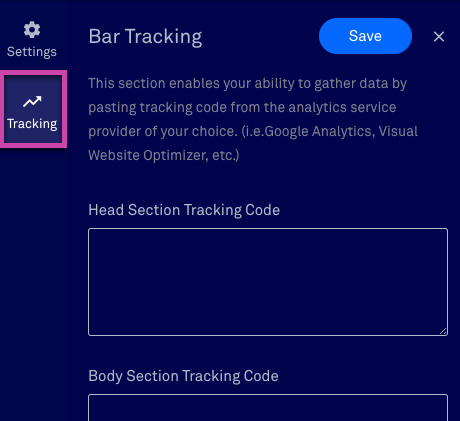 If you're looking to include third-party tracking code on your bar, navigate to the Tracking tab on the left-hand side of the bar builder. To publish your bar on a page, you'll use an embed code. You can then publish that embed code wherever you'd like your bar to appear. If it's your first time publishing your bar or you're inside the bar builder, you'll simply click Publish or Update at the top-right corner of the builder to access your bar embed code. You can also access your bar embed code from your account dashboard by navigating to the Conversion Tools tab, then Alert Bars. From the action menu more of the bar you’d like to publish, select Publishing Options then Copy Code. 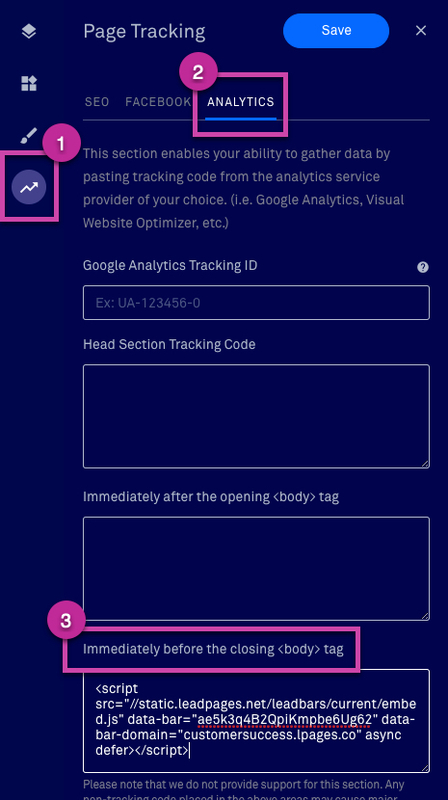 To publish a bar on a Lead Page or Leadpages Site, navigate to the Page Tracking section on the left-hand side of your page's builder, then Analytics. Paste your bar embed code in the section labeled "Immediately before the closing <body> tag." Click Save and Update your page. We recommend pasting your bar embed code before the closing </body> tag on your site or blog. For step-by-step directions on embedding a bar on your site, it's best to consult with the experts on the support team of whichever site builder you use. 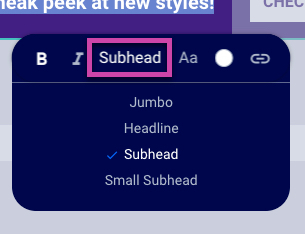 Can I use this bar in addition to the bar I already have inside my website builder? You can certainly try! We can't guarantee that the two will play nice together. From a marketing standpoint, we'd recommending using one or the other not to overwhelm your visitors.